Step one is making sure the picture you want to display is on the Internet. 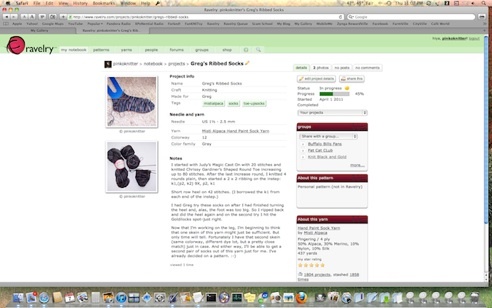 If it is one of your own pictures, you can upload it to Ravelry (as long as it’s related to a project) or to a web gallery such as Flickr or Photobucket. I have a web gallery through my Apple MobileMe account as well as a Flickr account, so I have a couple of choices when I upload pictures to the Web. 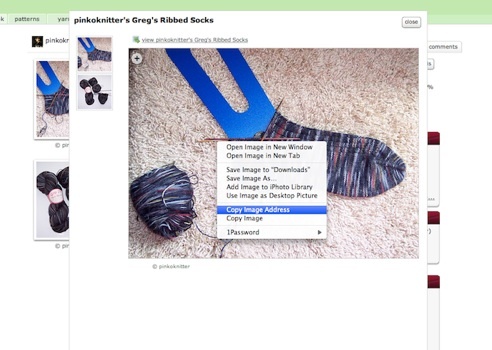 You can also embed pictures that you find on the Internet. The possibilities are endless. What follows are step-by-step directions with screen shots because, well, because a picture is worth a thousand words. LOL These instructions apply to Mac OS 10.5.x and 10.6.x. 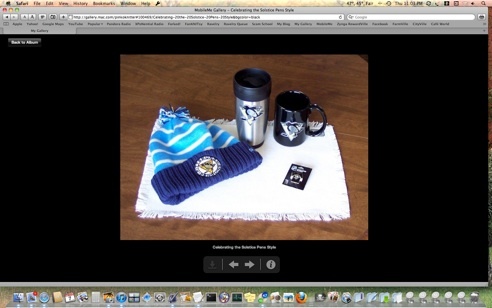 To display a picture from my web gallery, I first open the picture in my browser. 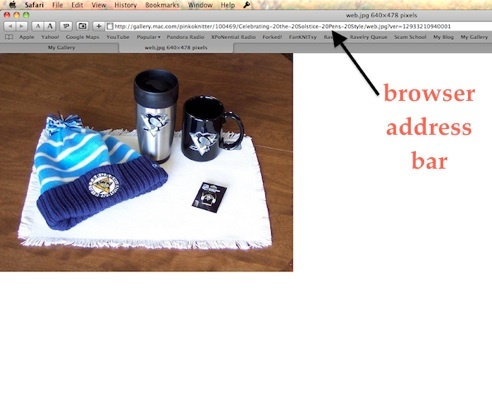 Although you might think that the URL up in the address bar would be the picture’s location, you would be wrong. If you use that URL, you will see the dreaded blue box when your message is posted. You need the correct URL, and the road there has a bit of a twist in it. In order to get the correct URL, you must first right-click (control-click) on the picture, then click on “Copy Image Address” in the contextual menu that appears. Now it gets a little complicated, but only a little. 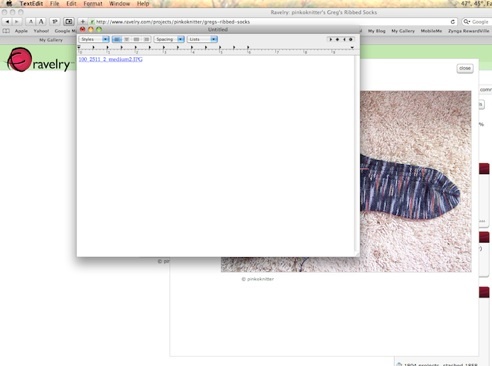 Paste the image address you just copied in a text editor or word processor. I use TextEdit. As you can see, what I pasted into the text editor–web.jpg– isn’t really a URL, but it is a hot link that will take me to the URL. This was the step I kept missing. What you have to do now is click the hot link that you just pasted into the text editor. This will take you to the image location. Look in the browser address bar. That, my friends, is the URL for the location of this particular pictures. You want to copy that URL. It is the key to your picture. If you want to display this picture in a message on a Raverly forum, click on the “picture tool” in the tool bar of the reply window. 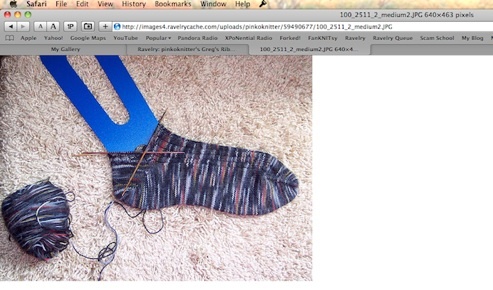 When you click on the “picture tool,” a pane opens into which you will paste the URL that you just copied. 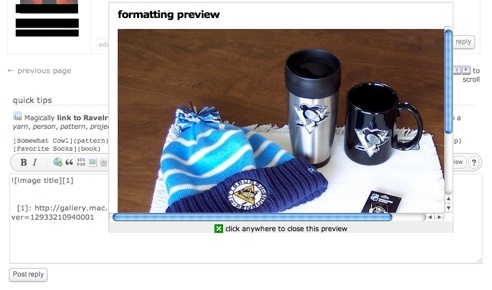 See, I pasted the URL from my Pens gear picture into the address window. 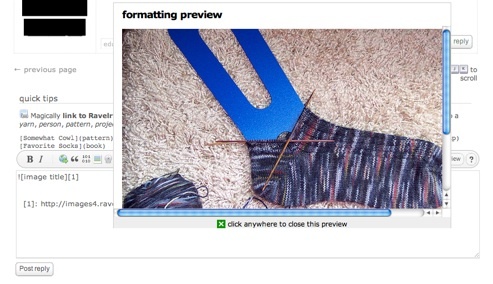 Click “OK” and Ravelry will “automagically” generate the code that will cause your picture to be displayed. But you won’t see the picture yet. You’ll see the code. In order to see the picture in the message before you post the reply, click the “preview” button at the upper right of the tool bar. Then you will see what your message will look like once it’s posted. 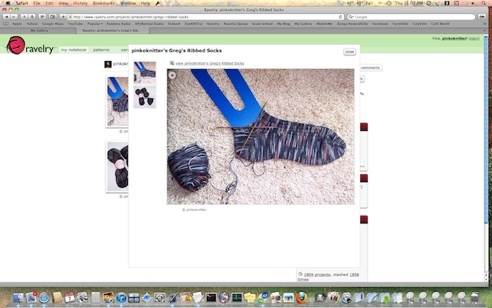 If the picture you want to use is one that you have already uploaded to Ravelry, just go to your projects page and click on the project where the picture is located. You’ll get a page like this. Click on the picture that you wish to display in your message and it will open in a separate window. In order to get the correct URL so that the picture will display in the message, right-click (or control-click) on the picture to get the contextual menu. 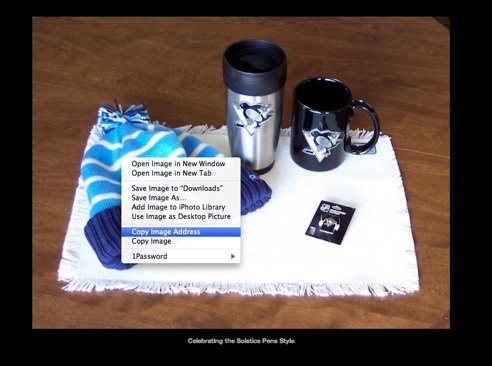 Then paste the “image address” in TextEdit (or the text editor or word processor of your choice). 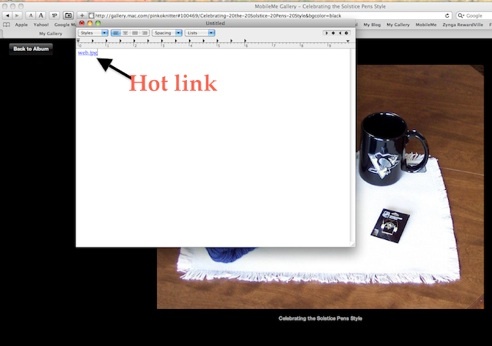 Once again, you can see that the “image address” that I copied isn’t a proper URL, but it is a hot link. Click on that link and your web browser will open to the location of the picture. 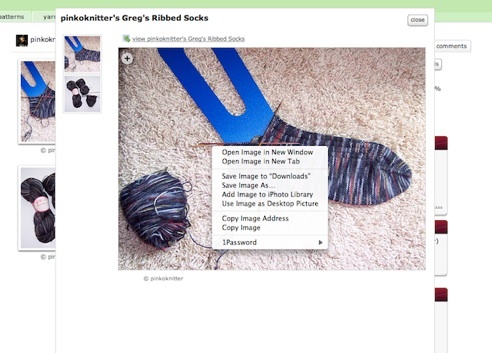 Now just copy the URL from the browser and paste it into the “picture tool” pane in the Ravelry reply window. Click “OK” and your picture will be embedded. If you want to check how the picture (and the rest of your post) looks before you send it, click “preview” before hitting reply. And that’s it. It might seem a little convoluted at first, but after you have done it a couple of times it will become second nature to you too.